The stretch of Pico Boulevard between Beverwil to the west and Crescent Heights to the east might be considered Los Angeles’ kosher restaurant row. Things are pretty quiet during Shabbat, which begins at sundown Friday and ends Saturday evening. But not all of the area's restaurants are kosher. Read on for our round up of some of the best restaurants, kosher and non-kosher, along the melting pot that is Pico Boulevard 90035. Carbs rule at Bibi’s, a modest storefront with about half a dozen tables inside and a couple more outside. There are sesame-flecked burekas, golden flaky pastries stuffed with potato or mozzarella. There are “Jerusalem bagels,” bagels the size of Frisbees, and taut little cinnamon rolls that beckon. 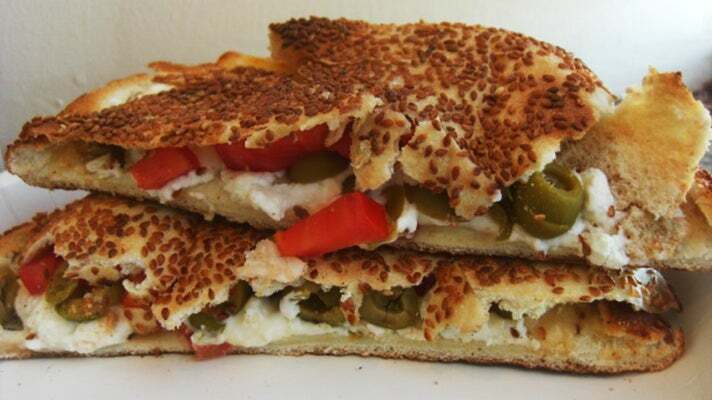 But our favorite item on Bibi’s menu has the too-cute moniker “toastee.” Get it on a sesame pita, Bibi’s very own, oversized, ultra-puffy round, which is cut in half and stuffed with your choice of a dozen or so ingredients. The simple combination of feta, tomatoes and sliced green olives is hard to beat. The whole thing is slipped into a fiery stone oven until the edges of the pita turn crunchy crisp and the cheese gets hot and melts. It's served sandwich-style with a side of garlic sauce not unlike Greek tzatziki. Tucked between a laundromat and a kosher fried chicken joint, Bodhi is a surprisingly stylish little Thai spot with polished concrete walls, exposed ducts overheard, peekaboo orange panels and a minty green swath to the rear. The menu features all the usual suspects. 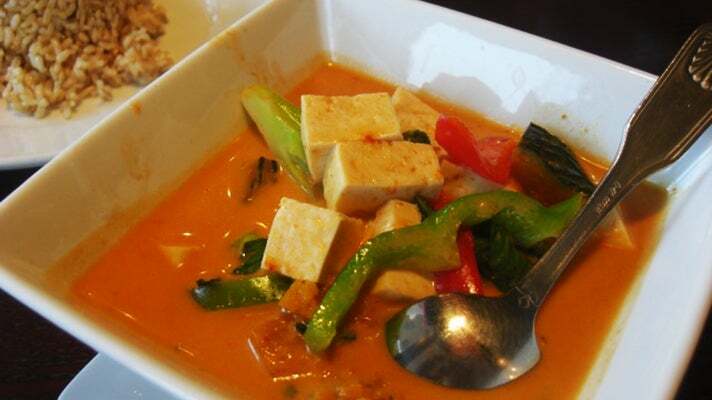 But it’s the curries we like best, especially the savory, mild pumpkin curry with chunks of sweet, tender pumpkin; broccoli and bell pepper, along with a choice of tofu, seitan, soy chicken or soy beef. Prices are higher than at most spots, considering rice must be ordered separately. But portions are generous. Not to be confused with Eilat Bakery (a perfectly respectable bakery a couple blocks to the west), Elat is a charming French-style bakery with high ceilings and soft, terra-cotta-colored walls. But because it is pareve (no meat or dairy), the croissants are made with margarine and the cappuccinos with soy milk. When the bakery opened across the street seven years ago, they started with just two items: sesame-flecked barbari bread, as big and flat as a snowshoe, and baguettes. 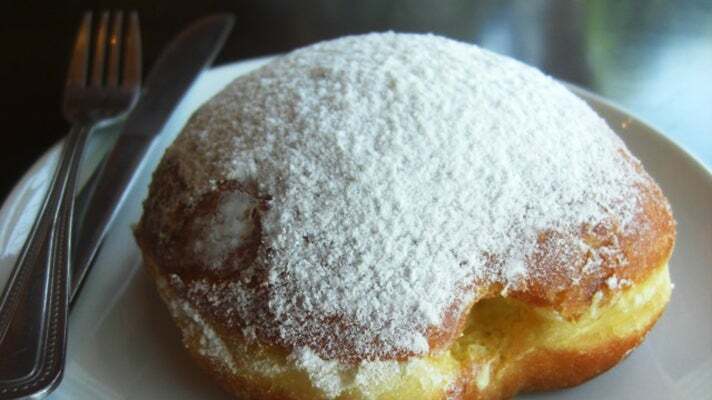 Now their displays feature pound cakes, mondel bread, rugalach, and perhaps most beloved, powder sugar-dusted Pirashki, a Persian treat with a texture somewhere between a raised and cake donut, sans hole, nearly as big as a softball and filled with luscious vanilla custard. Arrive too late in the afternoon and you might find that the guy at one of the two sidewalk tables is tucking into the last of them. Consider yourself warned. At lunchtime, our top picks at this smart, modern bakery and restaurant are the Mediterranean plate, a colorful assortment of salads, spreads and falafel; and the chakchouka, a robust tomato stew with a poached egg. Dinner brings more options, including Tunisian couscous and breik a l’oeuf, layers of crisp, paper-thin pastry enveloping egg, tuna and salty capers. 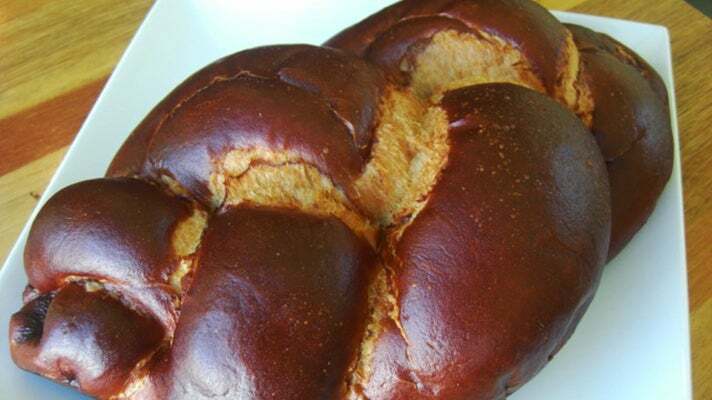 But the primary reason for the parade of customers starting Thursday afternoon and continuing into Friday is the pretzel challah, with a soft, moist, tear-apart inside and a tangy, just right salty exterior with a lovely golden brown sheen. They make it plain, which is delicious. The version shot through with nubbins of Belgian chocolate might be even better. Our favorite, however, being salt junkies, is the one with kalamata olives and rosemary, generally available by special order. Whichever you choose, it’s dangerously good. Try to resist pulling off giant hunks of it while driving. If In-N-Out were kosher and served sausages (and a million other things), it might look like Jeff’s, a terrifically popular fast food spot that turns out some mean seasoned fries. So crispy it’s like they have a crust, they come piled high in a paper basket, a deep burnished orange. (Ketchup not required.) Of course, one cannot live on fries alone, though the idea is not altogether unappealing. Naturally, there are sausages, all made in-house, including a firm Merguez, which is split, cooked on the grill, and served on a unforgettable bun with a heap of refreshing, finely chopped cucumbers and tomatoes. Among the burgers, the Western Burger rules. Its distinguishing feature is a crown of a fat, crispy onion ring and a healthy dose of “Western Sauce,” much like a certain aforementioned burger chain’s special sauce, but with an unapologetic Southwestern kick. It’s fabulous stuff. There are ovens, and then there is the steel wonder at Kabab Mahaleh, a beloved Persian kosher spot. As big as a Manhattan sublet, the oven features a slowly rotating grill, and a roaring fire that turns out enormous sesame seed-flecked wheat flour flat breads called sangak (alternatively, sanjak) with impossibly crunchy exteriors, an irresistible chew and just the right hint of doughiness. It’s a two man operation just making these wondrous breads, with one guy furiously forming them and patting them into shape and the other removing them from the oven in a quick, well practiced motion. Sangak is served alongside just about everything on the compact menu. Our favorites are the eggplant stew, a.k.a. 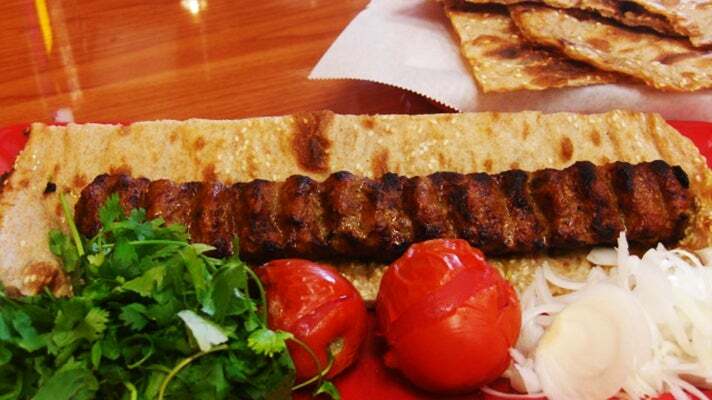 kashk o bademjan, and the ground beef kabab. The former pairs smoky eggplant with frizzled fried onions, bits of blackened mint and what we assume is faux yogurt, since the restaurant is kosher. (In this case, meat, but no dairy.) It’s utterly seductive, and torn off pieces of the sangak makes a perfect delivery system. The juicy, foot-long kabab, redolent of garlic and spices, comes on a bed of sangak with a heap of cilantro, raw onions and charred tomatoes. For a special treat, wrap some of the meat in the accompanying sangak and tuck in some onion, maybe cilantro, too. At $5.99, this might be the best deal on the boulevard. 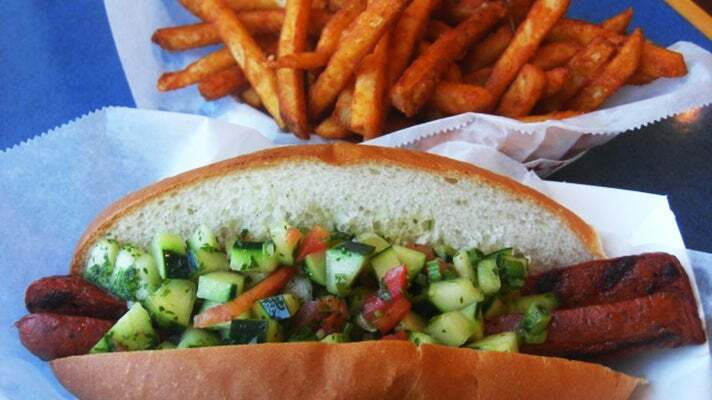 Of the delis that dot this stretch of Pico, Label’s Table stands out as a favorite. Let us count the reasons why. One, it isn’t trying to be anything other than a deli. You can’t get a burger here or pizza. Two, it’s unpretentious, to put it mildly. You order at the counter, usually from a guy who could take orders in his sleep, and wait to hear your number. The seating is faux wood-grain booths. The attempts at décor are minimal; some ferns overhead and a few movie posters. Three, and most importantly, the sandwiches rock. And you can order a half sandwich, which is really plenty the way they pile it on. The pastrami, edged with fat, is wholly satisfying. The default serving method is on top-notch rye bread, untoasted, with a generous lick of yellow mustard. But you can get it the way you like it. You can also request a new pickle in lieu of the usual dill. Because Label’s Table is not kosher, you can get Swiss on that roast turkey sandwich or follow up your chopped liver with rice pudding. Do keep in mind they close mid-afternoon Sunday and Monday. 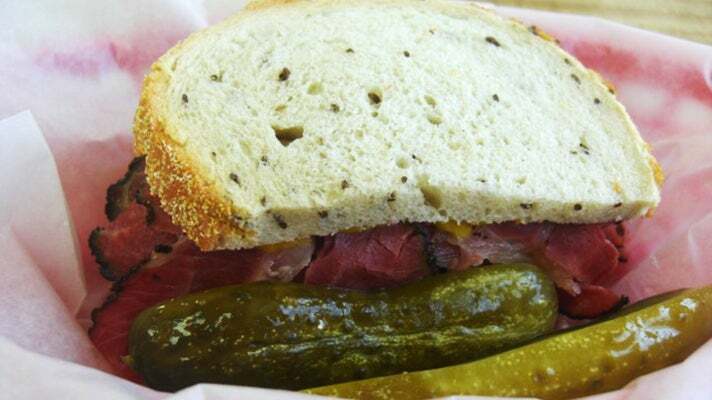 Many a pastrami seeker has been disappointed when they show up Sunday at 4 p.m. for their fix. This funky vintage diner, with its wall of autographed B-list headshots and somewhat incongruous stained glass saloon fans overhead, is like an old friend. And old it is, in L.A. restaurant time: it opened in 1946. You have to love a place with over 100 side-order options alone on an endless menu. Breakfast, the meal of choice here, is served all day, until at least 3 p.m., when Nick’s shuts down and the hipsters and assorted customers move on. Scrambles, served with textbook hash browns, are excellent. There’s one called Richard Grant’s and another called Laura’s Goodys (sic). Or you can create your own from a list that includes the expected (mushrooms, feta) and unexpected (Spam, anyone?). Not in the mood for breakfast? Burgers are solid. 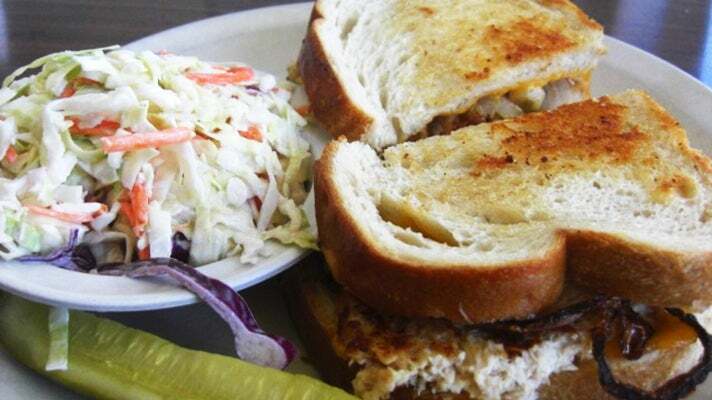 Ditto the tuna melt, though we could do without the fried onions, something of a distraction on this decadent classic. 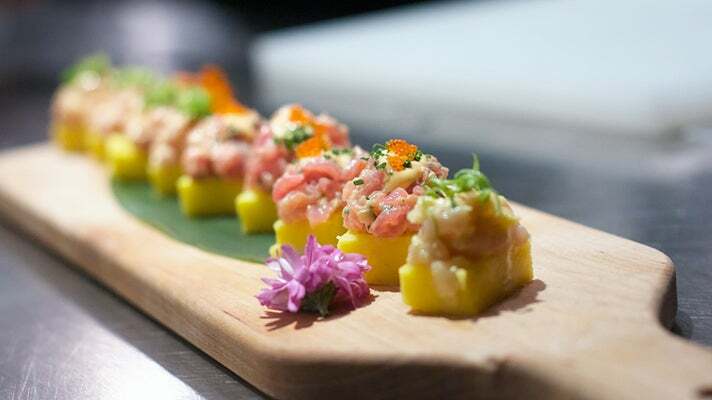 We’ve been fans of chef Ricardo Zarate since his days at Sai Sai, the Japanese restaurant in the Biltmore Hotel, where his knack for bold flavors and beautiful plating made a lasting impression. 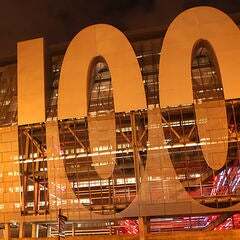 Now he’s got a fabulous and festive dining room, just east of Century City, in which to strut his stuff, with frenetic graphics on the walls, soaring ceilings and an electric buzz. You can’t help but be happy here, especially if you start with one of the spot-on Pisco Sours or the popular Meyer Lansky, made with Meyer lemon marmalade and fresh lemon juice. 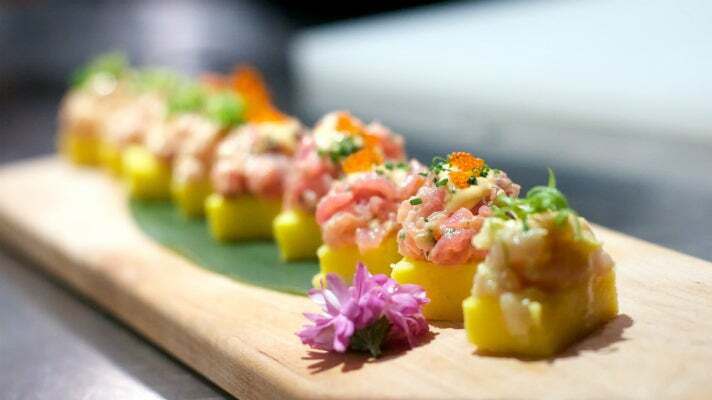 Our favorite place to sit is the counter, where you can watch the chefs painstakingly prepare the causas, Zarate’s take on nigiri sushi that substitutes a mellow, supple potato cake for the usual rice. We love the ceviche crocante's play of hot, crunchy calamari against the cool chunks of halibut in a bracing lime salsa de tigre. But the black cod in miso, cooked over the open charcoal grill until it is a beautiful burnished-caramel color, the flesh at once sweet and smoky, had us positively delirious. There’s a reason the line-up of cars to valet at cousin restaurants Picca and Sotto (restaurateur Bill Chait is the common denominator) is so persistent. Picca is a perfect party, not the kegger sort, to be clear. Sotto is dark, come hither and cozy and slightly rock n roll. The L-shaped dining room, a few steps down from the sidewalk, features low ceilings, dim lights, a snappy striped banquette and a soundtrack that might have been curated by KCRW’s Jason Bentley. Did we mention the aroma of sweet wood smoke that perfumes the air? The result is beguiling, especially when you add rustic brick-pressed chicken, cooked over white oak, until the skin is impossibly crisp, the flesh moist and smoky. 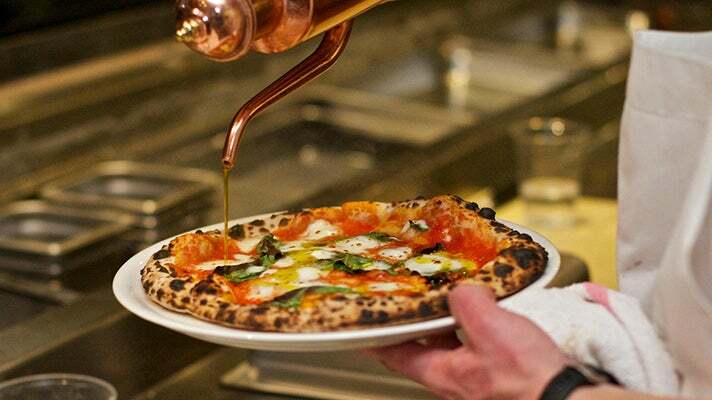 Equally good are the classic Neapolitan pizzas—a perfect crackle crust Margherita finished with fruity olive oil perhaps, or the guanciale, ricotta and scallion—cooked in a Stefano Ferrara hand-built oven that chefs Steve Samson and Zach Pollack joke is more famous than them. 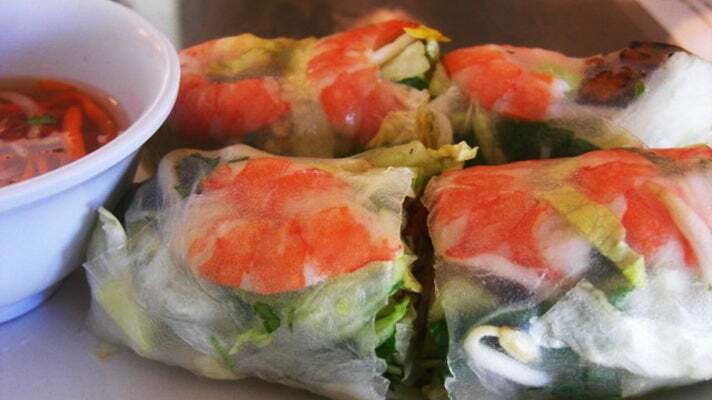 Vien Café, a Vietnamese restaurant just east of La Cienega, is a perfect first date spot. With its concrete floors, white architectural paper-orb light fixtures overhead and translucent copper-hued chairs, it’s modern and stylish without trying too hard. It’s also unexpected, still something of a neighborhood secret, having opened in 2012. So you’ll appear in the know. Most importantly perhaps, the food is tasty and reasonably priced, though perhaps a few bucks more than your typical pho house. Speaking of pho, Vien’s is excellent. And it is certainly the dish of choice. But you can also get delicate homemade crepes filled with chicken, shrimp and bean sprouts. Classic spring rolls stuffed with vermicelli noodles, veggies, pungent cilantro, tender shrimp and grilled pork make a perfect starter to share or a light lunch on their own.